Adad Hannah’s Rodin Reworked is a new body of works produced in collaboration with the Musée Rodin , Paris. This series builds upon his interest in the French sculptor Auguste Rodin’s (1840-1917) oeuvre in relation to the interplay between sculpture and the human body, and the ways in which we interact with art. Hannah has explored these ideas in conversation with Rodin’s art for more than a decade with projects such as Age of Bronze (2004) shot at the National Gallery of Canada, Burghers of Seoul (2006) produced in South Korea, Les Bourgeois de Calais: Crated and Displaced (2010) made in Calais, Unwrapping Rodin (2010) which was included in a touring show of Rodin’s work organized by the Montreal Museum of Fine Arts and the Musée Rodin, Paris, and The Burghers of Vancouver (2015), a collaboration with Quebeçois filmmaker Denys Arcand. Rodin was an avid collector of photographs, often drawing and painting on top of images of his own work. These photographs with pen, pencil, or gouache on them were used as ways to reimagine a work, to test an idea before rendering it in plaster in preparation for bronze or marble. Rodin also used bright pigments in his sketches, though his final sculptures were almost always monochromatic. Just as Rodin used other people’s photographs to imagine other ways his sculptures could be viewed Adad Hannah uses photographs and videos of Rodin’s sculptures to imagine other ways of viewing them - changed contexts, forms, and colours. 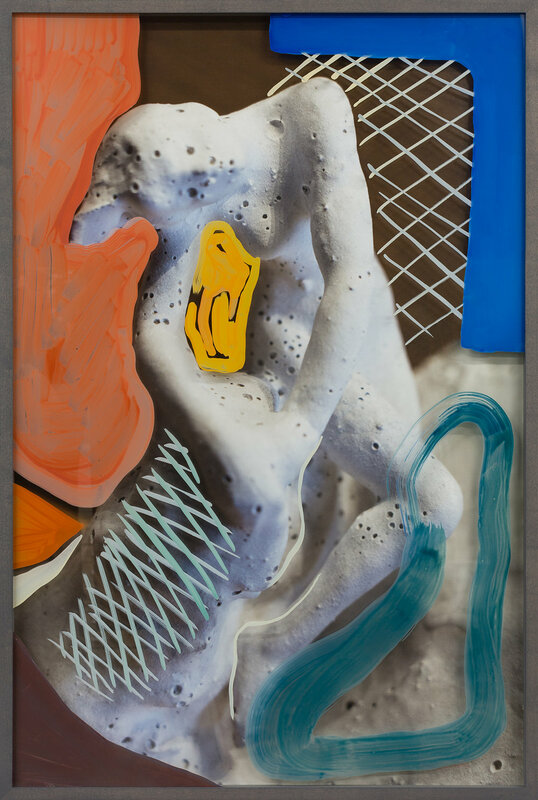 By overlaying still and moving images with sheets of frit-painted glass Hannah emphasizes how light and colour alter our perception of sculpture while exploring the distinctions between the symbolic presence of a sculpture and the organic physicality of the human body. These works also focus on the connection between the past and the present - mediating a conversation between Rodin’s 19th century sculptures and current photographic and mark-making practices. Having studied printmaking and painting early in his art training, this new body of work brings together Hannah’s earliest artmaking practices with the photographic and video works he has spent the last fifteen years producing. Over the past two years Hannah has developed a frit-painted glass technique that allows for the direct application of the frit - miniscule ceramic particles - on thin sheets of glass that are then tempered at a high temperature. This process produces ultra-stable translucent pigments that appear to float on the surface of the glass. The painted glass is then floated above the photograph, creating an interplay of colour, reflection, translucency, and opacity that highlights and obscures as a viewer’s own body moves around the artwork.